Search all of FischersPlace.com, or the entire web! FischersPlace.com is an Amazon Associate. We receive a small commission for items ordered with the links above, which helps to defray costs associated with this site. Thanks for your consideration. Welcome to our online home! To navigate this site, use the buttons on the left of this and most other pages, and also on the top of most pages inside There is also a button at the bottom of every page to return you here to this page. Well we have to admit that this website has gotten rather stale. We started using Facebook in about 2008, and for a time tried to keep this site up to date as well. But convenience won out, and it's much easier to keep posting on Facebook than keep this site up to-to-date. So it's a bit of a relic now - we haven't really updated it since at least 2010 and really not seriously since before that. But feel free to poke around a bit if you like. In particular, in our old online photo gallery you can find many pictures from past vacations, pets, families, home projects, and much more. Again, things fall off circa 2010, but there's still some fun stuff there. Also, our original Photo Album page contains even older content that hasn't been migrated to the newer gallery. 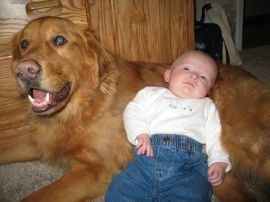 We're sad to report that our beloved dog Bailey passed away suddenly on August 12, 2009, just days before our vacation. We're still in a little bit of shock over how quickly he was taken from us when he was, so we thought, in the picture of good health (and only 7 years old). The boys really miss him, as do we all. Each year we put on somewhat of an elaborate computer-controlled Christmas display as a gift to the community. You can learn about these displays at PlymouthLights.com, our Christmas website. Featured there is information on why we do it, how the displays were created, links to other great Christmas sites on the Web, sections on Christmas Music and the Meaning , and more. Also if you're a fan of the display, why not become a fan of our Facebook page at facebook.com/plymouthlights? 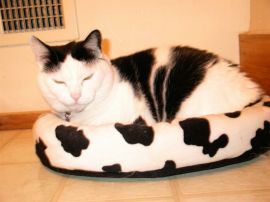 In early March 2006, our beautiful kitty MooCow was diagnosed to be in the late stages of Chronic Renal (kidney) Failure, an i ncurable disease. After a few weeks of performing various daily treatments to keep her as healthy as possible, her life ended on March 23. She is missed. We've set up a small tribute to her in the photo gallery. We also have a Tribute to Sampson, our former Golden Retriever who left us in October 2001 after nearly 14 loving years. Cathy and Tim celebrated our 10-year anniversary in October 2009. My, how time flies! If you want, you can actually find our old wedding website in "The Vault" via the button to your left. 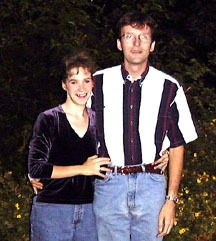 The picture below is from our early days-- we'll have to get a more current one up soon! Have fun browsing this site-- there's lots of fun pictures and tidbits of trivia about the Fischer family! Welcome to FischersPlace.com! Feel free to browse around using the buttons to the left margin of every page, or use the search function in the left margin of the home page. Thanks for stopping by! Don't miss PlymouthLights.com, our other website dedicated to our Christmas displays and celebrating Christmas all year 'round!